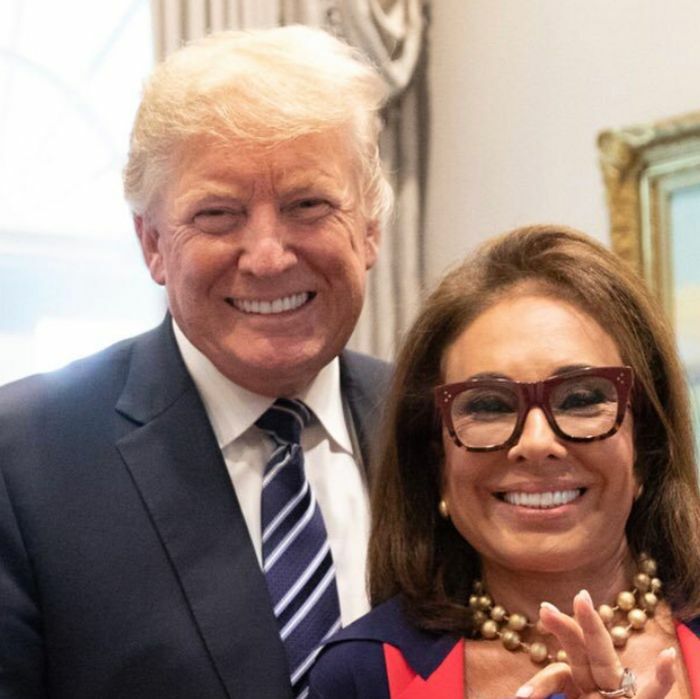 Fox News has suspended host Jeanine Pirro over Islamophobic comments she made during last week’s broadcast of Justice with Judge Jeanine, which did not air on Saturday night. Fox News has not publicly confirmed the suspension, but a source told CNN that the network had indeed benched the popular host. It is not clear how long the suspension will last, or whether anxious advertisers will continue to support the program, or if Trump’s subsequent attacks on the network will intensify — and what that could mean to his and the network’s shared base. In her last show, Pirro questioned the patriotism of Minnesota representative Ilhan Omar, one of the two first Muslim women to be elected to Congress last November. Pirro asked viewers to “think about” how Omar wears a hijab before suggesting that Omar’s belief in Islam was incompatible with being a loyal American. Implying that Muslims are inherently un-American is hardly new territory for right-wing pundits, but in this case Pirro’s retread didn’t just earn widespread criticism, but a rare public rebuke from her network. One day later, Fox News said it “strongly condemned” Pirro’s comments and that it had “addressed the matter with her directly.” By then, Pirro had already tried to backtrack after being publicly called out by a Muslim colleague at the network. She was just asking questions, she claimed. “People hate the word ‘invasion,’ but that’s what it is,” Trump said. The Christchurch shooter, who wrote that Trump was “a symbol of renewed white identity” in his manifesto, doesn’t hate the term either. He referred to Muslim immigrants as “invaders” in his justification for the rampage. The gunman who massacred 11 people at a synagogue in Pittsburgh last October said that he was concerned about “invaders” too, writing in social media posts that he blamed Jews for the caravans of Central American migrants who have been traveling to the southern U.S. border — migrant groups that were also promoted by Trump and his allies as a cynical scaremongering tactic to drive up turnout among his base in the midterm elections. Trump and others have even tried to suggest, without any credible evidence, that Muslim terrorists have been hiding among the poor Hondurans and Guatemalans in the caravans. White supremacist rhetoric makes regular use of the concept of immigrants or other nonwhite people being part of an invasion, and taking advantage of anxieties over migration is a textbook move for far-right political parties seeking more power. On Sunday, White House chief of staff Mick Mulvaney tried to dismiss the altogether obvious link between growing white nationalist violence and Trump’s rise to power on the back of racist, anti-immigrant rhetoric and policy ideas. Mulvaney said it was “absurd” to suggest any connection between the Christchurch shooter and Trump, and made it clear he is sick of insisting insisting that the president — who has called violent neo-Nazis “very good people,” Mexicans “rapists and killers,” and who campaigned on (and then partially implemented) an U.S. entry ban for foreign Muslims — is not a white supremacist. Responding to a question about the New Zealand attacks on Friday, the president downplayed the threat of white supremacist terrorism. “I think it’s a small group of people that have very, very serious problems,” he said — a statement which, at best, misunderstands some important and dangerous political changes going on across the globe. In his tweets on Sunday, Trump once again made it clear where his sympathies lie. Some have even suggested that the president, or whoever wrote the tweets he sent, was speaking in some kind of white nationalist code. Journalist Judd Legum commented on Twitter that one phrase, “be strong & prosper” echoed part of an account of the 1683 Battle of Vienna, a historical event white nationalists revere and something the mosque shooter referenced in his propaganda dump. Legum also concedes that it may just be coincidence. No extremism scholars appear to have made a similar or expanded link in response, and somewhat similar expressions can also be found in the Bible and Star Trek. Then again, why on earth does Fox News need to hear the warning “be weak and die” from the U.S. president? But if the connection is a mistake, it’s an easy one to make. The difference between white nationalism and Trump nationalism is often in the ear of the beholder. The native language of Trumpism has always been grievance, suspicion, and us-vs-them ultimatums, and he served up another big helping of them on Sunday. Whether you believe the tweets were directed at Fox News or racists with arsenals (or both), the message is the same. That’s not code. It’s his reelection campaign. And it’s the same kind of thing that helped him win the last time.